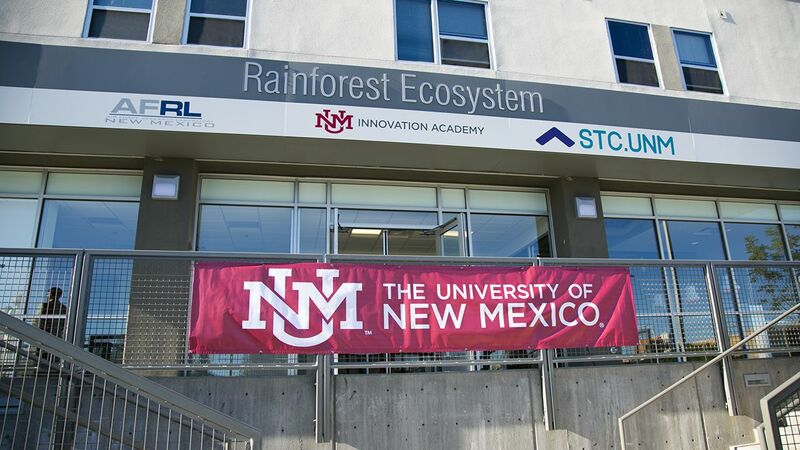 With tenants like the Air Force Research Lab and Sandia National Labs as well as UNM's Innovation Academy, STC.UNM and integrated campus housing, the Lobo Rainforest brings together academics and innovation designed to spur entrepreneurship in Albuquerque. Project leaders cutting the ribbon on the Lobo Rainforest building. UNM Acting President Chaouki Abdallah delivering remarks at the grand opening celebration. Albuquerque Mayor Richard Berry speaking at the Rainforest ribbon cutting. The Lobo Rainforest is made possible through a public-private partnership of UNM, the City of Albuquerque, Bernalillo County and others. UNM Board of Regents members Robert Doughty and Alex Romero touring the new facility. 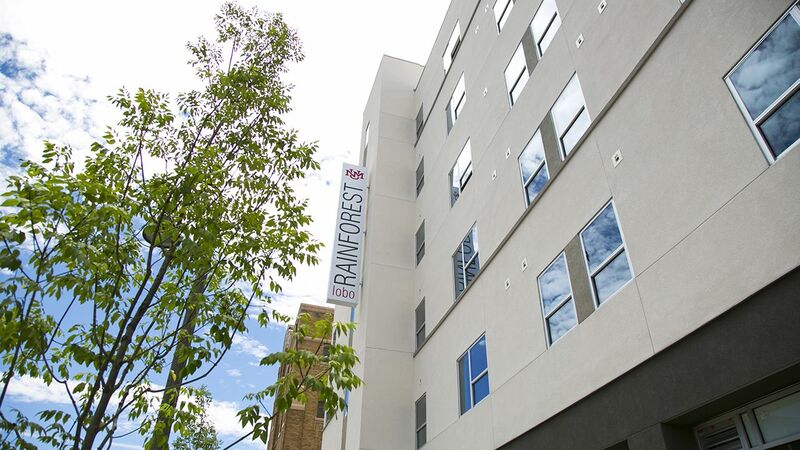 A rainforest has sprung up in the middle of New Mexico’s high desert, adding new life to Albuquerque’s downtown. 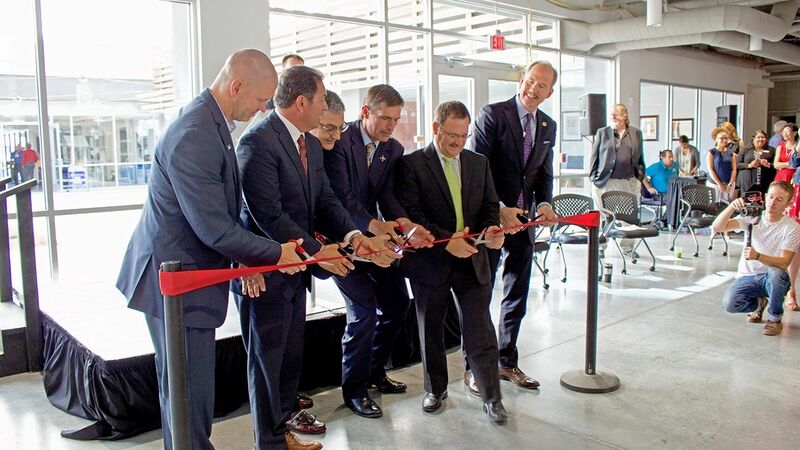 City, county, state and federal officials today joined The University of New Mexico and its private partners in cutting the ribbon to officially open the new Lobo Rainforest Building at the Innovate ABQ site at Broadway and Central. 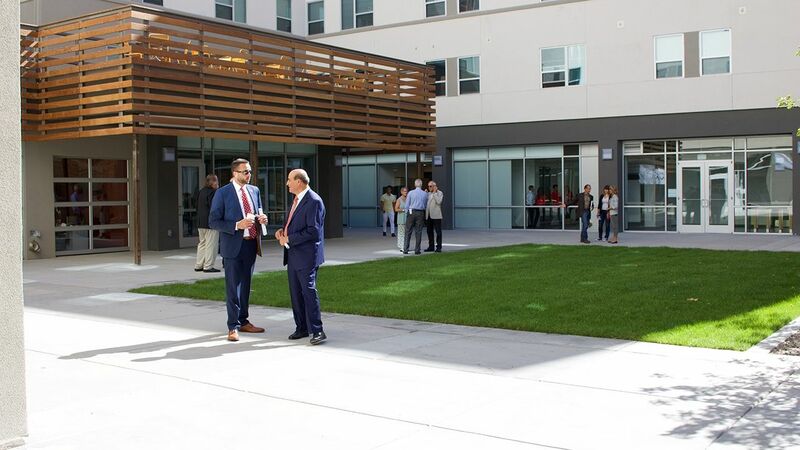 The $35 million, 160,000-square-foot six-story facility at the old First Baptist Church site will house students, Innovate ABQ tenants, and UNM’s Innovation Academy (IA). 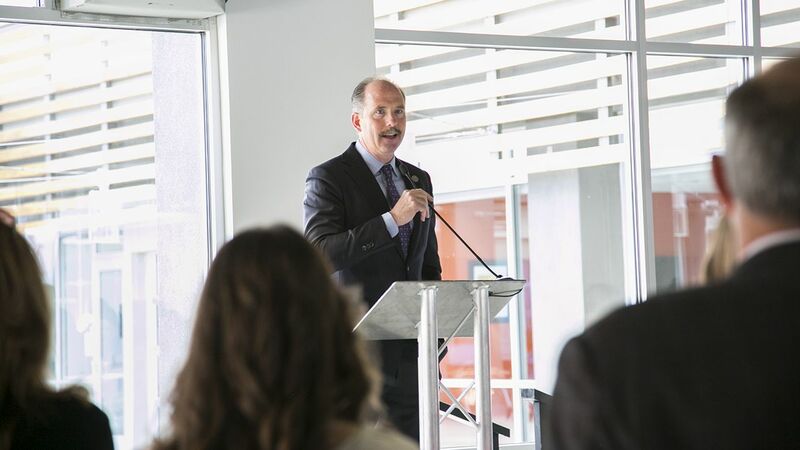 The live, work, play concept with its combination of academic and entrepreneurial components is designed to drive innovation, education and economic development in New Mexico. 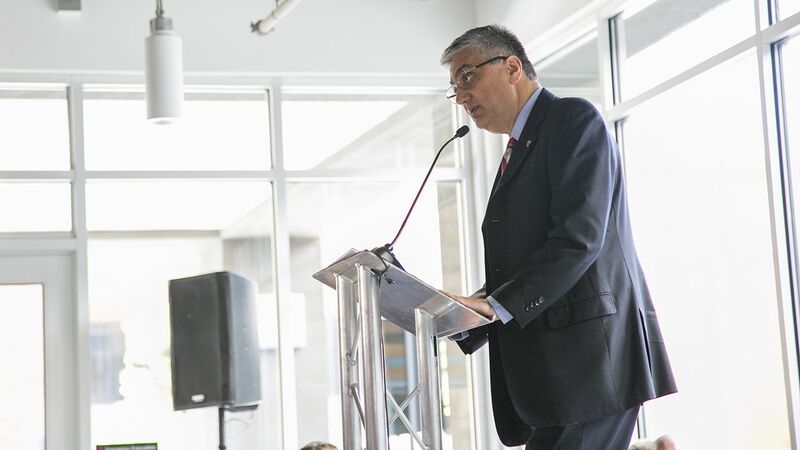 “We describe our Lobo Rainforest as human innovation ecosystem in which creativity, business acumen, scientific discovery, investment capital, and other elements come together in a fertile environment that nurture budding ideas so they grow into thriving, sustainable enterprises,” said Interim UNM President Chaouki Abdallah. The ground floor of the building provides an interesting mix of tenants, including STC.UNM (STC)—the University’s technology transfer and economic development arm—the IA, a Nusenda Credit Union branch, the Air Force Research Lab (AFRL) Technology Engagement Office, Sandia National Laboratories, General Atomics Electromagnetic Systems Group and several startup companies housed in STC’s business incubator—the Cecchi Venture Lab. Floors two through six are the living spaces for students. 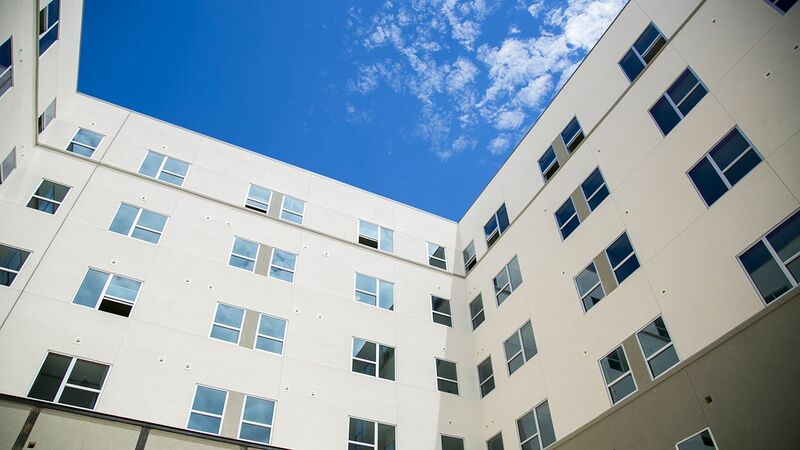 Spacious two bedroom, two bath apartment-style units include a full kitchen, living space, washer and dryer, and scenic views of the city. CNM’s Fuse Makerspace, in the renovated former Noon Day Ministry building at the Innovate ABQ site, will open later this month, providing a space for makers of all kinds to come and create. Renovation of the existing 70,000-square-foot First Baptist Church building and education wing next to the Rainforest building is planned for later this year and will house labs, business incubator and event space.